Re: Ronan to tour Australia and New Zealand? The untimely passing of Boyzone’s Stephen Gately has left many saddened and shocked. I can only assume bandmate and “brother” Ronan Keating is still reeling from the tragedy. Keating is due in Melbourne during Cup week but I wonder if he’ll be up to the visit after such a loss. Oh bless him. I hope he's OK. Perhaps the distraction will help him a little. A performance by Irish superstar Ronan Keating will mark the opening of a new music venue in Margaret River in the new year. One of WA's favourite music venues, Sandalford Wines in the Swan Valley, is expanding its popular concert series A Day On the Green to its Margaret River property, with the first concert slotted for January 16. Singer-songwriter Damien Leith will open the event, followed by performances from Keating - whose Boyzone bandmate Stephen Gately died this month - and Australian singer Tina Arena. A Day On the Green concert series has played host to music luminaries such as Leonard Cohen, Lionel Richie, Alicia Keyes, John Mellencamp, Steely Dan and Jimmy Barnes and entertained thousands of music lovers since it started in 2002. Sandalford Wines chief executive Grant Brinklow said the company planned to develop part of its 40-year-old vineyard in Margaret River into the premier winery concert venue in Australia. With an audience capacity of 12,000, Mr Brinklow said it was natural to expand the series to Margaret River. It would offer music fans value-for-money events and entice others to spend weekends in the famous wine region. DESPITE the tragic sudden death of his former Boyzone band-mate Stephen Gately earlier this month, Ronan Keating will honour his tour commitments in Australia. To coincide with the release of his new album, Stay, on November 13th, Keating will jet in to Sydney to play some key dates at The Entertainment Centre, and A Day On The Green concerts in the Hunter and Bowral. The ever-popular winery shows will be opened by Damien Leith and Keating will be supported by Tina Arena. Tickets are on sale November 6 from Ticketmaster. BESIDES Keating, November will see a plethora of international acts visiting our shores, including Pete Wentz from Fall Out Boy spruiking the band's best-of album, and Michael Buble supporting his album Crazy Love. Buble is also set to steal the show at Australian Idol's grand final with a hotly anticipated live performance. Grammy award-winning singer-songwriter and heartbreaker John Mayer will also be here for the KIA Live At The Chapel series. Just a week after attending the funeral of his old bandmate Stephen Gately, former Boyzone star Ronan Keating has announced plans to tour New Zealand. This week he is in Australia to launch his new album, Stay, billed as a collection of traditional and modern classics. It is his seventh since his 1999 solo album, when single When You Say Nothing At All entered the charts at No. 1 and became one of his signature tunes. Keating will perform at the Mudhouse Winery, Waipara, on February 5, followed by consecutive nights at Church Rd Winery, Napier, and Villa Maria Estate Winery, Auckland. He will be joined by local artists the Peter Urlich Sextet and Matt Joe Gow. Tickets go on sale on November 6 from Ticketmaster. Ronan Keating and Tina Arena have locked in dates in January for A Day On The Green. It has been eight years since Keating has toured Australia. This tour will include seven A Day On The Green dates as well as two indoor shows for Sydney and Melbourne. Damien Leith will also perform on the A Day on the Green shows. Now how do you like this? http://www.adayonthegreen.com.au/upload ... yer259.pdf That's an awesome way of promoting events, I wish they bothered to do similar stuff over here. Wow how great that he does so many dates down under. Fingers crossed he will do some European dates too! 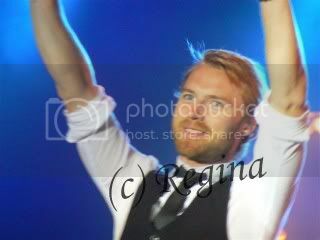 I have updated the diary on the site http://ronan-keating.com with the new dates and were you can book your tickets. Irish singer and Boyzone member Ronan Keating is heading to Western Australia during a solo tour of Australia early next year. Keating, who will be in Australia next week to launch his new album Stay, will kick off the tour in January 2010. The tour includes performances at two 'A Day on the Green' events in Western Australia, with full concert dates to be announced next week. He will be joined by Australian singers Tina Arena and Damien Leith. The shows are part of a tour through Australia, New Zealand and the UK and will be Keating’s first solo outing since 2004. Keating, whose hits include Life Is A Rollercoaster, Lovin Each Day, and When You Say Nothing At All, will also play three outdoor winery concerts in New Zealand in February. The tour announcement comes a week after the funeral of Keating’s Boyzone bandmate Stephen Gately, who died of natural causes while on holiday on the Spanish island of Majorca on October 10.
great news! so he will be in aussie next week,weird,no promo televison apparence sheduled? The news comes as members of Boyzone are in Los Angeles this weekend, at the invitation of U2, to attend their concert in the Rose Bowl stadium, Pasadena.